Heat gas or charcoal grill. Mix Parmesan cheese and taco seasoning mix. Coat chicken with cheese mixture. Carefully oil grill rack. Place chicken on grill over medium heat. Cover grill; cook 10 to 12 minutes or until juice of chicken is clear when center of thickest part is cut, turning once or twice. Cut each chicken breast in half crosswise; top each with half slice of cheese to melt. To heat dinner rolls, place 4 rolls each in separate foil packets on grill during last 6 to 7 minutes of cook time until hot. Spread mayonnaise on bottom halves of rolls. 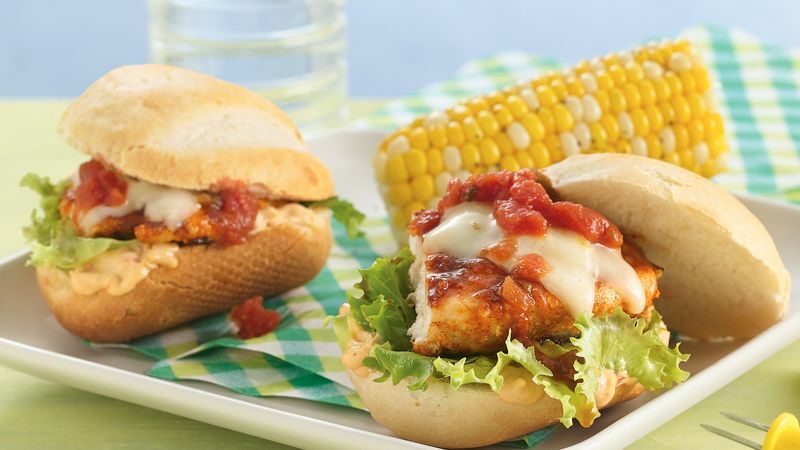 Top each with lettuce leaf, cheese-topped chicken, salsa and top half of roll. Try serving this sandwich buffet-style at a party and let guests create their own sandwiches. Broiling Directions: Place chicken on broiler pan; broil 4 to 6 inches from heat, using grilling times above as a guide.